DO YOU FEEL STAGNANT IN YOUR RELATIONSHIP WITH GOD? PERHAPS YOU DESIRE TO KNOW THE FATHER MORE INTIMATELY, HAVING A CLEAR CHANNEL OF COMMUNICATION AND FELLOWSHIP WITH HIM. Walking in Oneness is an insightful study that will help you understand the kind of relationship God wants to have with you. 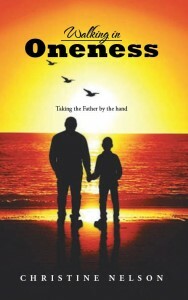 Exploring 10 key principles, this book will give you a clear picture of the Father’s heart towards you. God created man so that he could have fellowship with Him, this book illustrates how this fellowship and oneness is fulfilled by Jesus and how it can be fulfilled by you. CHRISTINE NELSON AIMS TO REVEAL MANY TRUTHS ABOUT THE FELLOWSHIP THAT JESUS SHARED WITH THE FATHER WHILST CANDIDLY SHARING ABOUT HER JOURNEY AND FELLOWSHIP WITH GOD. Click here to order Walking in Oneness.